Two legendary artists are coming to the Oak Mountain stage!!! Are you ready for this Falls incredible concert season!? 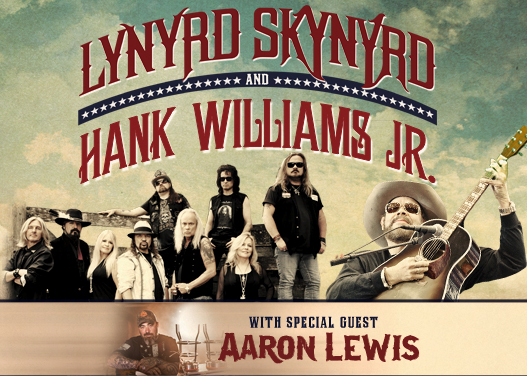 If not, be sure to prepare – grab your tickets to see Lynyrd Skynyrd & Hank Williams Jr. LIVE! As they perform at the Amphitheatre on Thursday 25th October 2018, you can secure your chance to be there! This is an extra special show as we will be waving good-bye to Lynyrd Skynyrd as they perform on their LAST EVER TOUR! Don't miss it! We have a lot of songs we've written through the years and we write a little bit here and there and have a few new songs we're gonna do,” Gary Rossington revealed in an interview, a pleasant surprise for fans! "We're gonna write a little bit more in the next few months and go in and record real quick and try to get our last CD to be the best one and go out on a high note and make it as good as we can and work our butts of to do it." It's time to say your goodbyes and let Lynyrd Skynyrd go out on a serious high as they bring together their dedicated fan base for an unforgettable night that will stay in the hearts of their fans forever. The legendary Southern rockers announced at the start of 2018 that this next tour would be their last and with that comes an exciting and enticing live performance as they travel across the US, they bring their fans a combined show of all of their biggest and most loved tracks. Come and be a part of the crowd! Lynyrd Skynyrd first took over the music scene during the 1970's, transforming the genre as we knew it they released massive anthems such as "Sweet Home Alabama" and "Free Bird". With a few years of grabbing the attention worldwide and making their very quickly way to stardom, they had an unfortunate accident and whilst they were at the top of their career, band members Ronnie Van Zant and Steve Gaines, and backup singer Cassie Gaines, died in an airplane crash in 1977, putting an abrupt end to the 1970s era of the band. For a good few years, many thought that the band would never return but in 1987 – after ten solid years, Johnny Van Zant decided it was time for a reunion and the band took to the stage with the remaining members. It became successful again and the group as taken to the stage on and off since then. With a whopping 28 million record sales in the US alone, these guys proved their weren't going anywhere. Right up until the beginning of this year, now with the announcement of a farewell tour, their career must come to a close, but don't fret their legacy will forever survive!